For many U.S. companies in the apparel industry, the old sourcing strategy of “made in China” is turning into “China plus Vietnam plus many,” with emphasis on the many. As Washington and Beijing continue to one-up each other’s tariff threats, the prospect of a looming trade war is driving U.S. apparel companies to further diversify their sourcing strategy and shift production away from China. While China remains the top sourcing destination for the U.S. apparel industry, the country now accounts for 11%–30% of companies’ total sourcing volume, compared to 30%–50% in the past. These insights come from the fifth annual benchmarking study, released by the U.S. 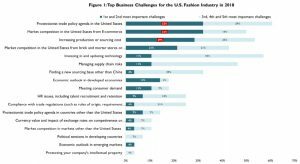 Fashion Industry Association, on the industry’s sourcing practices and views on trade. The U.S.’s protectionist trade policy has become the industry’s top business challenge, with e-commerce competition and increasing production and sourcing costs closely following. As the chart below shows, more than three out of five respondents cited protectionist trade policy as one of their top five business challenges. 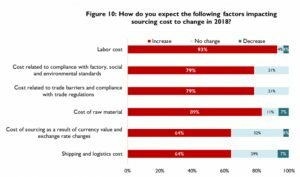 Compared with 2017, however, the challenges of rising sourcing costs and the need to find alternative sourcing destinations have become much more immediate. 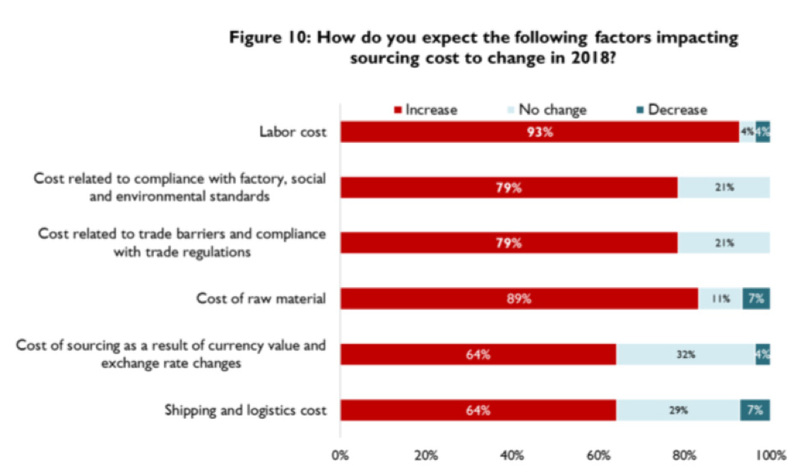 Fifty-four percent of respondents cited “increasing production or sourcing cost” as one of their top five business challenges this year, compared with only 34% in 2017. This may be because absolute production costs are in fact rising, the report suggests. Moreover, companies may be compelled to opt for more expensive sourcing destinations as a result of the U.S.’s protectionist trade policy agenda. Large companies (1,000+ employees) are much more likely to have a diversified sourcing base. More than two-thirds report that they source from at least 11 different countries, and 26% source from 20 different countries. In contrast, only half of companies with fewer than 1,000 employees source from more than 10 different countries, although this is a dramatic increase from 10% in 2017’s benchmarking study. Disaggregating by business type, brands and retailers tend to be more diversified in their sourcing than importers, wholesalers and manufacturers. As for sourcing destinations, China, Vietnam, Indonesia, India, Bangladesh, Cambodia, Thailand, Philippines, Mexico and the U.S. make up the top 10. The percentage of respondents reporting that their company sources more than 30% of their volume from China has decreased to 26% from 39% in 2017. In 2018, only 15% source more than half of their volume from China, compared to 19% in 2017. Each of these sourcing destinations have their own strengths and weaknesses. The geographical proximity of sourcing domestically or from Mexico is a major factor for U.S. companies. Bangladesh and Vietnam, however, offer the most competitive pricing, even though that cost competitiveness is eroding. Furthermore, the higher compliance risks associated with sourcing from South Asia give the U.S. another competitive edge. This year’s respondents also voiced worries about social and environmental compliance, political unrest and insufficient resources for managing supply chain risks. Eighty-five percent say that they plan to devote more resources to managing sustainability and social compliance over the next couple years. The majority of companies can map their supply chains down to tier-2 suppliers, and as one might expect, this is more common for companies with fewer than 10 sourcing bases. Nevertheless, this increased attention to supply chain sustainability suggests that the apparel industry is continuously adjusting its sourcing strategy in response to social and business demands. 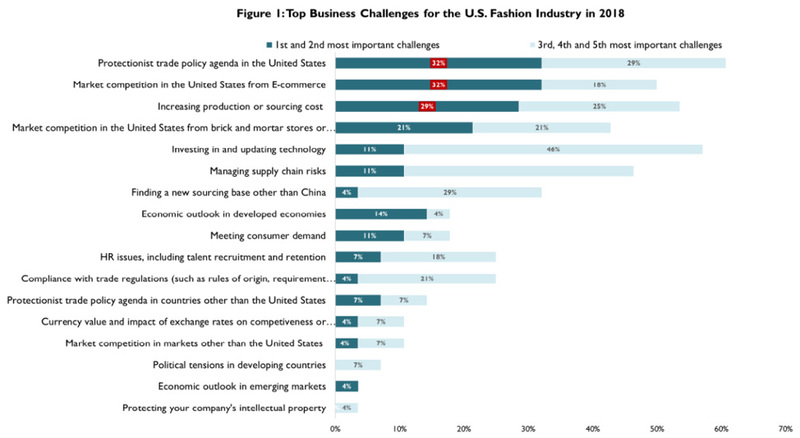 So where is the overall sourcing strategy going for the U.S. apparel industry? Away from China, certainly, with more production shifted to Vietnam and Bangladesh. Cambodia and sub-Saharan Africa are also expected to play a bigger role. The full benchmarking study can be found here. A.T. Kearney’s 2018 Reshoring Index: Has the Reshoring Trend Reversed?